The mobile transmitter is the latest addition to an extensive programme of electronic tagging. Researchers aim to fine-tune 12 years of results with the self-propelled craft and raise public awareness of the area’s diverse wildlife. Shark fans are able to follow the animals’ movements via a free app for smartphones and tablet computers. The project is led by shark expert Professor Barbara Block from Stanford University, who describes the area off the coast of San Francisco as the "blue Serengeti", comparing its underwater highways to the migratory routes in Africa. Her latest project follows on from a 10-year programme dedicated to tracking predators in the Pacific Ocean using electronic tags on creatures ranging from seabirds to turtles. The study revealed that the waters were a hotspot for a variety of species which frequent the area depending on the season and water temperature, many migrating between Mexico and Canada. 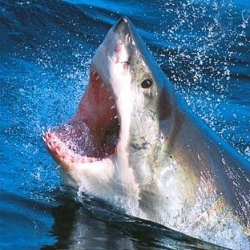 According to Prof Block, the great white sharks in particular demonstrated an "incredible homing ability". But to further investigate their behaviour, she required a "mobile observatory". "Across the planet the goal of oceanographers and biologists alike is to observe the ocean in as much detail as possible," she said, explaining that unobtrusive equipment is the key to accurate data. After first hearing about the "environmentally friendly" unmanned technology developed by the Silicon Valley based company Liquid Robotics, Prof Block said she became "infatuated". The bright yellow shark-tracking robot designed by the company consists of two parts – a glider that descends 23ft (7m) down into the ocean with a surfboard above. The glider has a special wing system that converts wave energy into forward thrust to keep the robot moving through the water. It also has a receiver that picks up the audio signals from the sharks’ electronic tags.